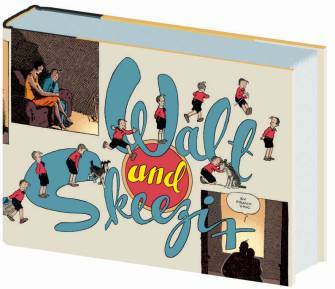 Walt and Skeezix vol. 4: 1927-1928 (Drawn & Quarterly) – I’m in heaven when one of these comes in. Two solid years of great comic strip storytelling that brings to life an era before my parents were born, lovingly presented in a gorgeous package. Oh, man. Modern Masters: Mark Buckingham (TwoMorrows) – I’ve been a fan of Bucky’s for years, and I’ve been flipping through this book, full of wonderful art and a nice long and comprehensive interview, since it came in. Delightful stuff. Captain America: Reborn hardcover (Marvel) – Ed Brubaker. Bryan Hitch. Butch Guice. Captain America. What’s not to like? Usagi Yojimbo #127 (Dark Horse) – Stan Sakai’s wandering samurai rabbit has been a treat since I first met him in Critters, and one that’s only gotten better, deeper and richer over time. Savage Dragon #159 (Image) – Erik Larsen’s unapologetic all-out, pedal-to-the-metal superhero series. Still bringing it, issue after issue, and leaving most of the rest of us in the dust. Turf #1 (Image) – I love Tommy Lee Edwards’ work. Don’t know much about Jonathan Ross other than that people whose taste I trust think he’s a good guy. But mobsters, vampires and aliens in the Roaring-and-about-to-explode Twenties? I’m there. Phonogram: The Singles Club (Image) – I didn’t think Kieron Gillen & Jamie McKelvie’s first Phonogram series fell together as well as it might have (it read a little too much like a repurposed John Constantine story, and I thought they missed the opportunity to make phonomancy—magic driven by music—distinctive and affecting), but it was very close, with interesting ideas, and they got more confident at it as they went on. So do I want to read the next round? You bet. Witchfinder: In the Service of Angels (Dark Horse) – I don’t know anything about it, really, except that it’s written by Mike Mignola and looks like spooky Victorian horror-adventure. What else do I need to know? Grimjack: The Manx Cat (IDW) – Ostrander and Truman. And more Grimjack. Again, what more do I need to know? Getting any of these books would be a reason to be happy. Getting all of them at once is a real pleasure, tantalizing to the mind and soothing to the soul. This entry was posted in Uncategorized and tagged captain america, grimjack, jersey gods, mark buckingham, phonogram, savage dragon, turf, usage yojimbo, walt and skeezix, witchfinder by Kurt Busiek. Bookmark the permalink.